I’m not trying to sound negative about her at all, but in all honesty, during the days of C-ute Suzuki Airi wasn’t really on my radar one way or another. I appreciated her being a member of Buono whose music I really enjoyed, but that was about it. When C-ute disbanded in 2017 I was fully expecting to more or less never see her again in my realm of interests. Of all people going solo, I would have never expected to become a fan of Suzuki Airi’s, but hot damn her solo career has been pretty terrific so far. I mean, her album made it into my top five for the year. That’s a pretty steep climb for someone I was once indifferent too. All I can do is bow in astonishment at the talented young woman she has become. Clearly she was busy while I was seeing life through an Umeda Erika and Yajima Maimi lens. As my fandom of 48 Group dwindled over time, idol TV shows basically aren’t a part of my routine anymore. I used to watch idol shows all throughout the week. Now, I watch one or two as a lead-in to my Saturday night music time. While the optional show comes and goes (usually it’s the Whatever-BINGO of the season) There is one show left that I absolutely love and always watch, and that is Hiragana Oshi. Hiragana Keyakizaka46 was another pleasant surprise. What was originally supposed to be the Keyakizaka46 under members has turned into their own full-fledged group for.. some reason. I’m glad it happened, because they are a wonderful group of idols. They also lucked out big on their television program. It’s a super fun format full of true variety, instead of just the dull talk segments that most idol TV has become. 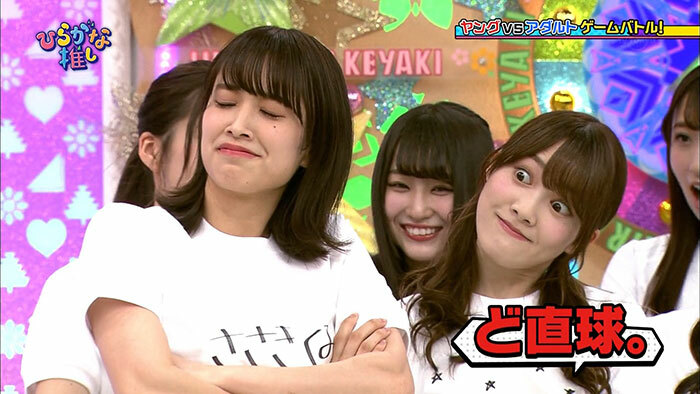 Comedian duo Audrey are also the best hosts to come around since AKBINGO’s legendary duo Bad Boys. They really make this show work even better. It’s a great show and I hope it sticks around.